I'm seeing damage on ripening tomatoes in southwest Ohio caused by Brown Marmorated Stink Bug (BMSB) (Halyomorpha halys) nymphs. I first saw damage from both the adults and nymphs on my own tomatoes in 2015. At that time, we didn't know which direction BMSB populations would take in the southwest part of the state. Would they become apocalyptic like in the Mid-Atlantic States or would they settle into becoming a "background" problem? Thankfully, BMSB has followed a more moderate population trajectory in southwest Ohio compared to elsewhere with high populations confined to localized "hot spots" rather than being widespread. However, that doesn't mean BMSB can't present a challenge to both backyard gardeners as well as commercial growers. Even low populations can produce noticeable damage making tomatoes unsalable or not usable as table fare by home gardeners. Both nymphs and adults use their piercing-sucking mouthparts to puncture the epidermis and extract plant juices. On green tomatoes, the damage may appear as whitish spots with indistinct borders. Although the spots may only measure 1/16 - 1/2" in diameter, they can merge to affect large areas of the fruit. On ripe tomatoes, the damage appears as hazy golden yellow spots. Stink bug damage may be superficial with little impact on the tomato flesh. While damaged tomatoes are still edible, their unsightly appearance reduces their marketability. However, heavy feeding may produce areas with whitish, spongy tissue, and feeding sites can initiate infections that enhance the "eww yuck" factor. BMSB management on tomatoes is a challenge owing to the often sudden appearance of damage to ripening tomatoes. Heavy damage can occur before gardeners realize they have a significant bug problem. There's also a challenge with a limited number of insecticides labeled for use on ripening tomatoes. You must always read and follow label directions paying particular attention to the time between the application and the harvest of vegetables called the "harvest interval." Unfortunately, this may preclude the use of many common insecticides if tomatoes and other targeted vegetable plants have ripened fruit that you're planning to harvest. Do not use traps thinking they will protect the tomatoes. Research conducted by the University of Maryland showed they do the opposite: they actually invite more bugs to the tomato party. Likewise, if you're growing patio tomatoes, keep the outside lights turned off at night. They serve as "eat here" signs. Finally, if you only have a few plants, the bugs can be managed by close inspections and digital control for the nymphs (use gloves! ), or by using the "knock off and stomp" method for the adults. 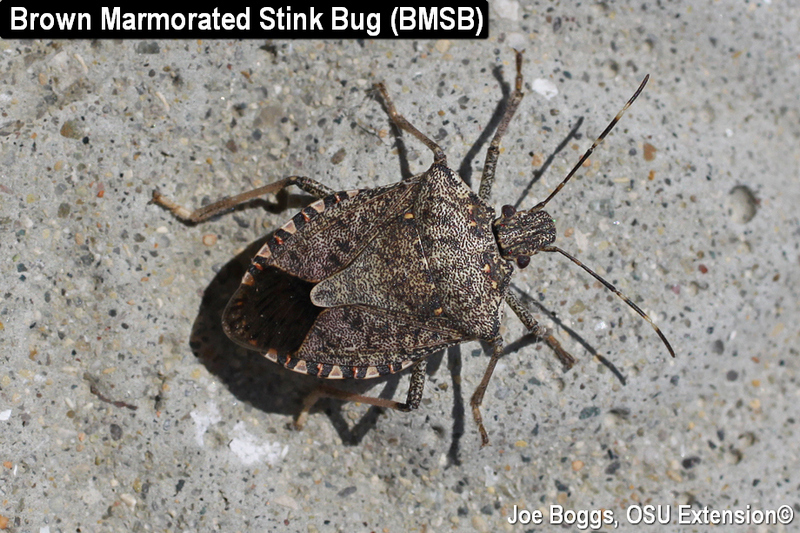 I love the smell of stink bug in the morning! Of course, you may want to leave your shoes outside.